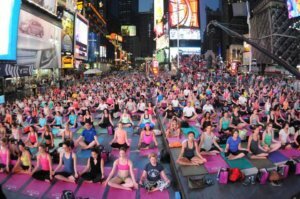 This year, Wednesday, June 21, marked the third International Day of Yoga and millions of people all over the world joined in to celebrate it. Throughout the week many festivities took place all over the country, India and the world. 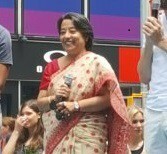 On Wednesday, Consul General Riva Ganguly Das made a special appearance at the Summer Solstice International Day of Yoga Event in Times Square where she addressed a crowd of more than 1,000 people who were there to take a break from their busy New York life to join in the celebrations for the International Day of Yoga. 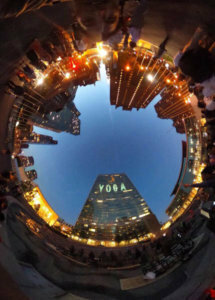 Thousands celebrate the International Day of Yoga in Tines Square. 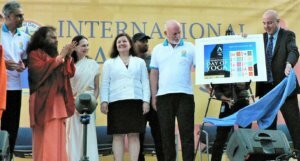 The UN also held an event on Tuesday where more than 1,000 people showed up to see the revelation of the Yoga Day stamp worth $1.15 and depicts different yoga poses next to a large Om in Devanagari script. According to IANS, a unique element in this year’s event projecting India’s soft power was the water puja ceremony led by Swami Chidanand Saraswatiji and Sadhvi Bhagwati Sarawastiji of the Paramarta Niketan Ashram, Rishikesh, they poured over a globe while participants prayed for clean water for all. Peter Thomson, the president of the General Assembly, said the practice of yoga was the embodiment and India’s Permanent Representative Syed Akbaruddin said yoga symbolized the union of humanity and India shares it with the world in an open and inclusive way. 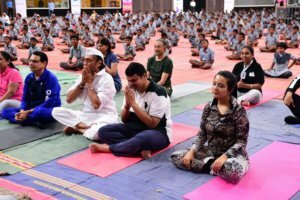 Chidanand Saraswatiji said that yoga can be a solution to many problems and wants to send out the message of “Green Yoga” using the help of other yoga practitioners and teachers. “When we are facing violence and war, (this) is the time to send the message, ‘No more war, no more violence,’ to take the message from yoga,” he said. IANS also reported that Bhagwati Sarawastiji called yoga “vasudeva kudumbakam” in action and said it had the power to break borders to bring peace and heal the suffering caused by separation. On Wednesday, a forum on yoga and health is to be held at the UN with an international panel of swamis and yoga practitioners including Chidanand Saraswatiji, Bhagwati Sarawastiji, Swami Sivadasananda of the Sivananda Yoga Retreat House, Austria, Keith Mitchel, a yoga practitioner and former US National Football League star, Stanton Kawer, a US business executive and activist actor Anupam Kher. The Consulate General of India in hosted a kickoff event on Monday where 60 people showed up to participate in various yoga demonstrations and view a message from Narendra Modi. 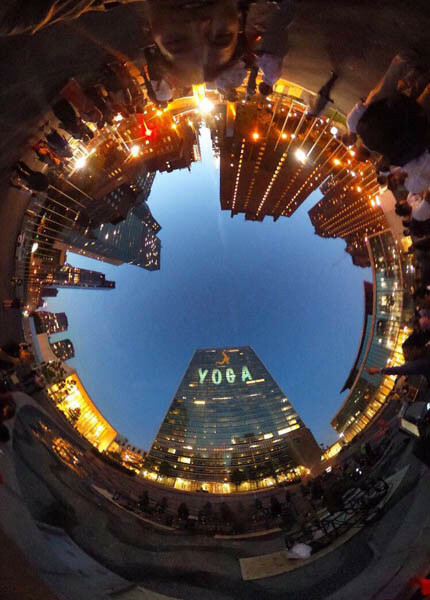 On Sunday, Actor Anupam Kher inaugurated the animated light show of the ‘asanas’ projected on the UN Secretariat building. 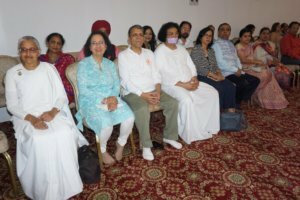 Jagdish Sewhani spoke at the third International Day of Yoga held in Long Island, where amongst those who participated were members of the Art of Living, the Brahama Kumaris, members of the Sadguru Isha foundation, Ranju Narang of Om Meditation and Acharya Lokesh Muni. Brahma Kumari Sabita Geer, Indu Jaiswal, Jagdish Sewhani, Acharya Lokesh Muni and Consul Devdasan Nair seated at the celebration of the third International Day of Yoga in Long Island. 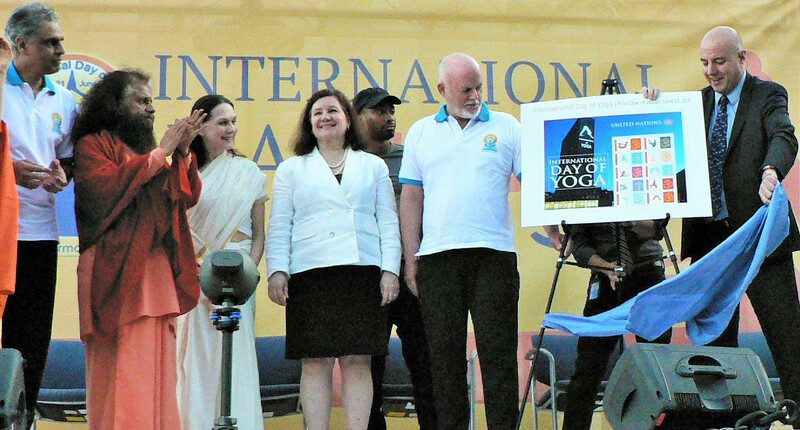 Also, hundreds of people attended the International Day of Yoga celebration held on the National Mall in Washington D.C. Since the General Assembly declared June 21 as the International Day of yoga in 2014,174 countries have adopted it unanimously. 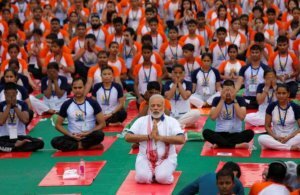 Prime Minister Narendra Modi celebrated the International Day of Yoga in Lucknow this year with a crowd of about 50,000 people, despite rain. “Yoga has connected the world with India. Yoga is about health assurance. 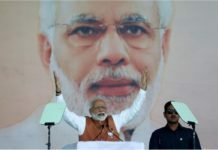 It is not even expensive to practice,” said Modi cheerfully. 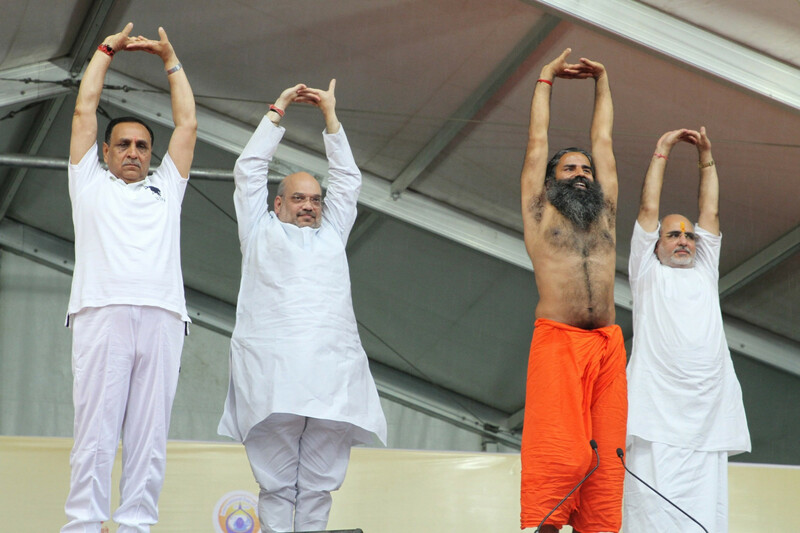 Baba Ramdev, BJP President Amit Shah, Gujarat Chief Minister Vijay Rupani, Deputy Chief Minister Nitin Patel and former Chief Minister Anandiben Patel led a yoga session for as many as 3,000 people on the grounds of Gujarat University in Ahmedabad. Modi’s speech from Lucknow was broadcasted live in Ahmedabad. Celebrations for the International Day of Yoga were held in many other cities and states in the nation including Chandigarh, Punjab, Haryana, Kolkata, Mumbai, Telangana and Andhra Pradesh. Chandigarh saw nearly 3,000 people at their main event which was held at the Sector 17 Plaza; Haryana saw hundreds of people at the main event at Indri town in Karnal district and in Punjab, events were held in Amritsar, Ludhiana, Jalandhar and Bathinda. Modi was seen celebrating the International Day of Yoga in Chandigarh last year where it was held at the city’s iconic Capitol Complex. In Mumbai, celebrities among commoners participated in the state’s main event held in Worli. Celebrities who attended were: Maharashtra Chief Minister Devendra Fadnavis who was also accompanied by his wife Amruta and Bollywood actors; Jackie Shroff, Arbaaz Khan and Malaika Arora Khan. 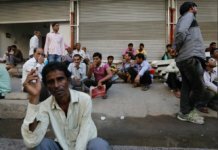 Over 10,000 naval personnel and their families and Indian Army officers took part in the celebrations as well aboard ships and special yoga camps in the military areas of the city. Thousands of people also joined in to celebrate this peaceful day in Kolkata, Telangana and Andhra Pradesh. Countries such as China, Pakistan, UAE, Bangladesh, Mexico, Peru, Israel and Egypt held their own celebrations and events.